Have you heard of the China known as "The Land of the Divine?" Ancient myths and legends throughout history record that the Middle Kingdom was continually guided by celestial beings. Traditional Chinese culture attributes all aspects of its civilization to the heavens, including its script, medicine, attire, music, and classical Chinese dance. It is this tradition of divinely inspired culture that Shen Yun Performing Arts will be presenting in New Brunswick next week and at Lincoln Center in January. Shen Yun has toured the world for five seasons, sharing the beauty of this lost culture through classical Chinese dance. Classical Chinese dance is one of the most comprehensive dance systems in the world. Dynasty after dynasty, it was passed down among the people, in imperial palaces and ancient plays. Thousands of years have refined it into a distinctive dance system embodying traditional aesthetics. One of the strengths of classical Chinese dance is its expressivity. It can vividly depict a wide range of emotions and portray any cherished virtue- righteousness, loyalty, benevolence, and tolerance. It can be masculine and vigorous, soft and graceful, somber and stirring, playful and humorous. Such range is achieved through bearing and form. Bearing describes the physical expression of one's inner spirit. Spirit leads to movement, thus bearing leads to form. Form refers to Chinese dance's external appearance-hundreds of unique movements and postures. An accomplished performer makes them appear effortless, but they require a perfect coordination of the entire body that takes years of rigorous training. A dancer's every cell-from toes to fingertips, from the angle of the head to the direction of the gaze-must be in perfect harmony. Classical Chinese dance also has an extensive array of techniques-jumps, spins, flips, aerials and other very difficult tumbling moves. These supplement and enhance the dance's expressive powers while adding vigorous physicality. And yet, classical Chinese dance is still mostly unfamiliar to the West. But that is quickly changing. 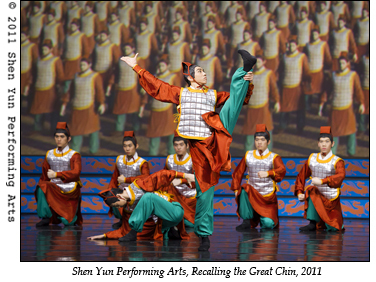 Shen Yun is the world's premier Chinese music and dance company; promoting an authentic form of classical Chinese dance is part of its mission. Based in New York, Shen Yun is very different from companies coming out of China. "With Shen Yun, we use classical Chinese dance in its purist form, we don't mix in modern, contemporary, ballet, and other dance forms until you no longer know what you are watching," says choreographer Vina Lee. "Authentic classical Chinese dance can really give the audience an uplifting experience of pure goodness and consummate beauty." And with 5,000 years of civilization to draw from, Shen Yun has plenty of source material. Through dance, Terracotta Warriors awaken from the dust, the Song Dynasty general Yue Fei comes to life, Monkey King and Pigsy escape another sticky situation, maidens grace a heavenly palace, drummers shake the yellow plateaus of the Middle Kingdom. A renaissance of Chinese culture has begun and one of the world's ultimate dance forms is blazing the path. To see where Shen Yun Performing Arts will be appearing next, click here. This article originally appeared in The Epoch Times.